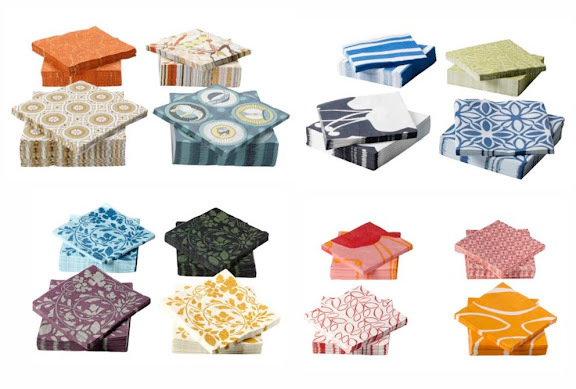 I am a huge fan of IKEA napkins for a few reasons...1. they are fairly substantial and of the perfect weight...2. they are inexpensive...3. they have great solid colors and outstanding designs. On my last trip I spotted these new designs and fell in love with just about every one--they are some of the best I've seen yet. You can check them out online here. Note: While you can't purchase them online, you can read product descriptions and use the product locator function to see if the style you want is in stock at your local store. I love Ikea napkins also. I buy them all the time. I make trips to Ikea often just to browse and always come home with a few packages of napkins. I sorta want to frame these and put them up as art.